Every Wednesday and Saturday the weekly Maspalomas Market takes place on San Fernando's municipal area around the municipal market hall - the MERCADO MUNICIPAL. 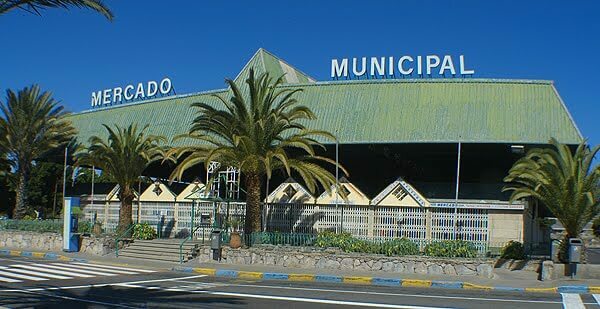 Every Wednesday and Saturday the weekly Maspalomas Market takes place on San Fernando’s municipal area around the municipal market hall – the MERCADO MUNICIPAL. It starts at about 8:00 in the morning and finishes about 2 o’clock, with its peak time from 10:00 to 12:00. Most stalls start packing up at one. The Maspalomas Market is one of the biggest in the south and attracts loads of people, both locals and tourists. People come by bus and taxi, or walk from their nearby hotels in Playa del Inglés and Maspalomas. As the demand is big, many market sellers from all over the island come with their goodies, making the Maspalomas weekly market the most diversified markets there is on Gran Canaria. You can get fruits and vegetables, clothes, bikinis, hats, jewelry, toys and much more. Aloe Vera products are always present on different stalls. Inside the market hall, various butchers offer their goods. There are German, Dutch and Spanish butchers, who offer meats and cuts imported from their countries. And then there are the fresh juice stalls, from which you can order any combination of freshly made fruit juice you fancy. On most of the market stalls, except on the food stalls, haggling is expected. When you ask a price, offer half or less and see how the sellers reaction is. From that you will know if he is willing to bargain or if he only sells his goods at a set price. Quite often you will be able to bargain the price down to a lot less of their first price or the number it says on the price tag. Tip: the later in the day, the better you can haggle down the prices in your favour.